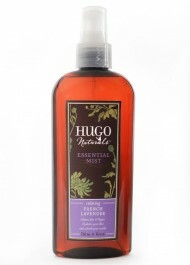 I received a lovely amber bottle of Essential Mist in Calming French Lavender to review. You might remember my review of the Indonesian Patchouli & Sandalwood Massage and Body Oil. Hugo Naturals also sent that wonderful product. The Essential Mist is a great all over body spray for after bath or shower. A few spritzes cools down my skin and is a great way to add quick hydration. This blend of purified water and essential oils can also be used as a fabric refresher. Consider spritzing a few pillows, a stuffed animal or a babies blanket in a nursery with this calming lavender scent. Even spritzing the furniture in the living area to give that calming effect throughout the house. You can even spray your hair with it if you like. Since there is no carrier oil you do not need to worry about greasy hair. I really love the quality of the products at Hugo Naturals. I love that they are cruelty free, vegan and gluten and Soy free. One thing that I really love about the product is that they do not use any artificial colors or synthetic fragrances. I am allergic to yellow #5 and it bothers me to no end when companies needlessly add cheap synthetic dyes to a product that is going to be placed on the skin and absorbed into the body or ingested into the body. More and more people are developing sensitivities to these ingredients and suffer side effects from an accumulation of these toxins in the body over a period of time. So, I embrace companies that are conscious of that.